Okay so it wasn't totally a disaster, but it turned out pretty...well for a lack of a better word, interesting. Originally, I planned on baking some green tea cookies, but couldn't find the matcha powder in time. So then I wanted to bake a banana walnut loaf, but didn't have enough bananas. Finally, I decided to get creative (note to self: creativity is NOT a good asset in baking, one must try not to deviate too much from the exact menu) and bake a peanut butter chocolate loaf instead. 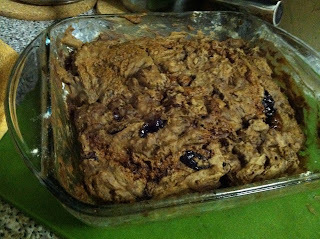 I had some chocolate organic soy milk and leftover chocolate covered raisins that I wanted to use up, so I followed the recipe for the banana maple bread and just swapped the bananas for the chocolate. Unfortunately I didn't have a bowl large enough to use my electric mixer, and I didn't want to clean up afterwards for the flying flour or the sticky tough on the mixer, so I used a spatula instead. 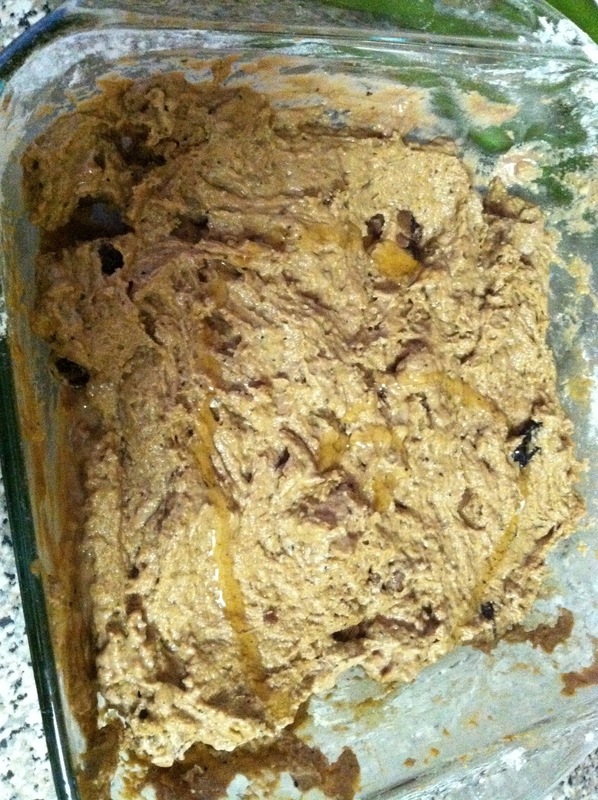 I mixed in a quarter cup margarine, two tablespoons of PB, and the remaining bits of my chocolate. To melt it, I blasted it in the microwave. I guess I should have noticed something was wrong when all the power was shut off due to over-usage in middle of zapping the stuff. Then when the power went back on, I heard strange crackling noises (I suppose that's the PB or the nuts inside the chocolate). I had a sudden fear of blowing up the glass casserol container and the microwave, so I stopped it just short of one minute. Then I started to mix in the flour. The recipe called for two cups, but after I had filled up one cup, I knew that I couldn't do another cup lest the container overfilled. I wondered to myself why the recipe was so inaccurate about the flour-liquid ratio. Brushing that aside, I started hand-mixing the dough with soymilk. 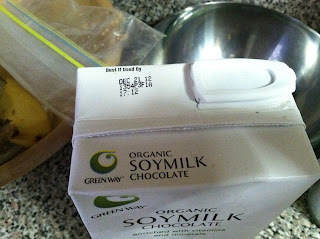 When I glanced down at the soy milk, I noticed that it was best used by Dec 21, 2012, which of course as everyone should know by now is the end of the world as deemed by Mayan prophecies (and subsequently made famous by the movie 2012). Great, I thought to myself. I guess I should name this cake End of the World Chocolate Cake, because after all, you need to savor the moment. I added some salt in it to balance out the taste, which works according to the principle of yin and yang. It was great, considerable effort to mix in all the flour. I had to constantly mix in the soy milk to keep it from clumping. I almost thought I should refrigerate this a bit and turn it into a cookie dough instead, but was too lazy to get back to it an hour or two later (it was already late into the evening). 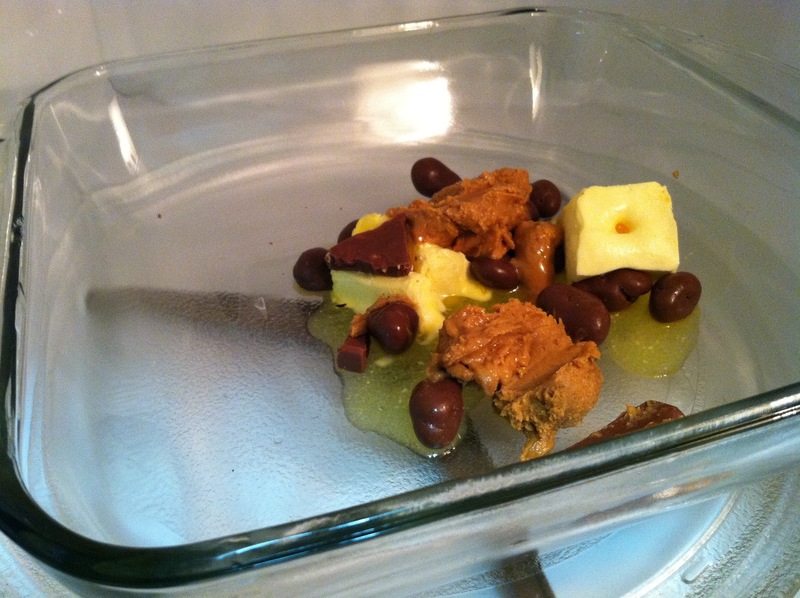 Finally, I put in the baking soda and baking powder, and a drizzle of honey. Okay so I was going to serve some hot cake a la mode to hubby, but he didn't want any. I guess his intuition or stomach saved him, because when he did try it, well, let's just say that his face went green. "It's bitter!" he said grimacing. Then I tried some, and it was sweet. Then I tried his piece, and true to his word, it was bitter and tasted like toothpaste. Then it hit me, because I got lazy and didn't use an electric mixer, the baking soda didn't mix well, so whatever was sprinkled over it at the end must have tasted like toothpaste. And secondly, when I complained that it was too much flour, it was actually because the measuring cup I used was a 4 cup, not a 1 cup! So although this creation didn't quite live up to par, I think it lives up to its name quite fittingly.